At DSL we take our environmental obligations and impact very seriously. Being accredited to the ISO 14001 standard demonstrates our commitment to uphold our obligations and our goal to reduce our impact, not just locally but globally. Transportation of our products come with an inherent carbon footprint, even more so when importing from our Far Eastern partners. When air freight is used, we always consolidate shipments and use global courier companies such as UPS, FedEx and DHL, all of which have their own Environmental policies. Closer to home, DSLs courier for our UK and European deliveries has a Carbon Neutral Commitment policy whereby they review, reduce and offset their carbon emissions. 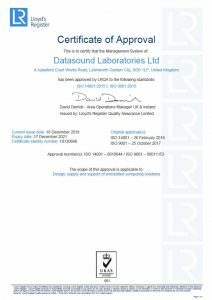 As part of our continual improvement, DSL are actively looking to source suppliers who are ISO14001 accredited, or at the very least, have their own environmental polices and can demonstrate adherence to their own commitment. DSL will continue to promote to our supply chain the benefits of thinking about the environment. All waste steams generated by DSL, are identified and continually monitored. To minimise the amount of waste going to landfill, tin, cardboard, plastic and paper is segregated and recycled using local accredited agents. Our waste electrical and electronic equipment (WEEE) is also segregated, recorded and collected by accredited recycling agents. We also offer the mechanics of electronic waste recycling to all our clients.